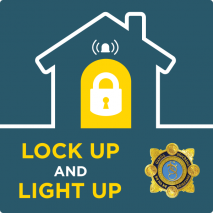 It’s that time of year again and An Garda Síochána have reminded us to be vigilant, lock up and stay safe this Winter – see the Operation Thor’s Lock Up Light Up campaign 2016. In the winter months, residential burglaries increase by 23%, so with some small steps and actions on your part, you can help deter would-be thieves – make them think twice. Whether you are at home or going out, remember to turn on some lights, use timer switches, lock all doors and windows, use an alarm, store keys away from windows and letter boxes and don’t store large amounts of cash or jewellery in the house. The website of An Garda Síochána has numerous leaflets, tips and guides for crime prevention.